MUST is an accredited online university dedicated to promoting quality yet affordable education through its 16 diversified schools and 71 majors. MUST University is the first choice of students across the globe for its exclusive services and experiences offered to them from all walks of life. Explore the cutting edge benefits offered to MUSTians and discover how they are using these benefits towards their education to make a greater difference. MUST University offers more than 850 program combination for you! MUST University is the largest online university in terms of the number of programs and courses offered. MUST University offers programs more than 1100 courses in 16 schools of study and 71 different majors. Many of these fields are highly exclusive and MUST is the only online distance education university offering education in these fields. MUST University locations spread across the entire globe with representatives in across in 6 continents, making quality education more accessible to you. MUST University students receive global acceptability among top employers. MUST University also offers education through its affiliate institutes and universities located in several countries and regions in the world. These partners MUST University provide education in affiliation with MUST University in a typical campus based environment. To provide exceptional career services to our students at MUST University and improve their employability through career counseling, webinars, corporate events, employment resources, internships & job placements, job listings and searches. You may qualify for Scholarship - almost 90% students do qualify! All credits will be accepted. With the help of credit transfer, you can reduce your fee and time required to complete your university program. FREE credit transfer evaluation!!! Complete your university program in less than a year or even lesser!!! MUST's University's programs are self-paced and self-study programs allowing you to study at your own pace and schedule. You can complete your program in less than a year. You can study from your home, office or any other place. Study online from anywhere with complete ease. FREE study material - You don't need to buy books ! MUST University is accredited by International Accreditation Organization (IAO). 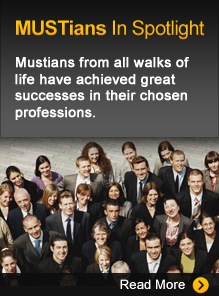 The accreditation of MUST's University programs by IAO is a testament to the quality of MUST's education. You can pay complete fee at once and get 14.5% additional discount. Easy-to-use automated online classrooms, designed by our global faculty cover both theory and practical aspects of the courses and includes case studies and real life examples. Available 24x7 - study courses with utmost ease and flexibility. The self-paced, flexible nature of our education with no time pressure for completing courses in a given time frame creates the best learning and development for working adults. Also, our global faculty works continuously on curricula enhancement process and on different ways to better impart learning through distance education process. Educational consultants are available 24 hours a day and 365 days a year to help prospective and existing students and alumni of MUST University. All students get access to the easy-to-use personalized student area. Through this area, you can take online exams, view program summary, and schedule, pay fees, request documents and do much more. All alumni of MUST get access to a personalized alumni area. Through this area you can easily use different alumni services such as requesting documents, updating profile, and other alumni services etc. MUST University provides FREE lifetime credentials verification service to all students. All the student documents can be easily verified through online document verification system, phone, fax and email. MUST University has partnered with reputable and top national and multi-national companies for employment opportunities for MUST University students through our unique corporate partnership program. Our partner employers seek MUST University graduates for employment opportunities and refer our programs to their employees. Enroll with only $499 ! Our 3-step simple admission process is very easy. After enrollment your student area will be activated and you will be able to access your classroom right away.